Scott joined the Triangle team 30 years ago. He was fresh out of trade school and was hired as a machine operator making steel valves on the Hardinge Chucking Lathes. At that time, Triangle had about 45 associates and he recalls how tightly knit the machinists were when they played together on baseball and bowling teams. Triangle’s current President, Dax Strohmeyer, was still in elementary school. In 1987, Neal Strohmeyer was in the process of taking over the day-to-day operations of Triangle as his father, Willie, transitioned to retirement. During this time, Scott had the pleasure of getting to know the Strohmeyers well. The work ethics of Willie and Neal both mirrored and inspired Scott’s own work ethic and he continues to lead by example today. He credits Neal with giving him direction as well as inspiration, which has stayed with him and drives him to continuously look for ways to improve Triangle. 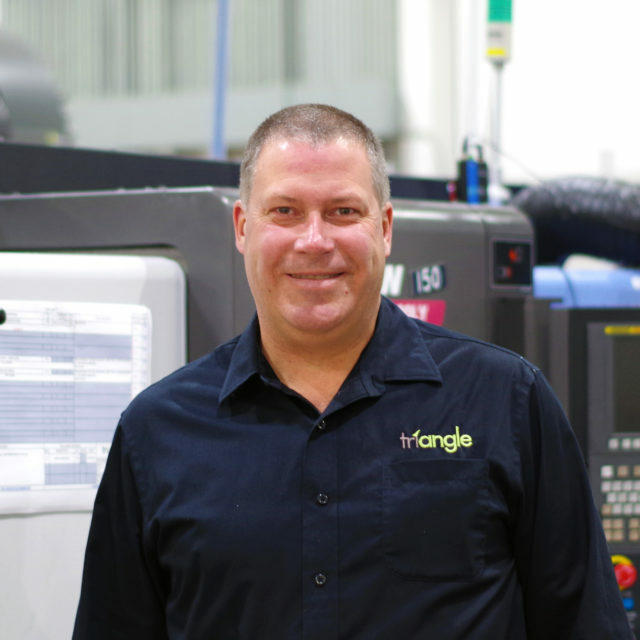 During his first year at Triangle, Scott transitioned from machinist to maintenance technician. He thought it was a better fit because he enjoyed fixing things and his knowledge of the equipment made it easier to do fabrication and machine repair projects. Today, as our Facilities Manager, he does everything from routine preventative maintenance to changing out spindles. He also oversees building maintenance and renovation projects. The maintenance team has grown from one associate to seven as Triangle continues to expand. Triangle’s physical growth would not have been possible without Scott’s meticulous management and oversight of the three significant facility renovations during his time at Triangle. The project he is most proud of is the transformation of our newest facility, 24 Park Way, from an “empty dungeon” into a state of the art production facility for medical devices. Scott’s leadership and coordination allows us to continue to expand and renovate within each of our facilities as needed, with minimal, if any, interruption to daily production. Family is very important to Scott. He enjoys spending time with his wife Alice and daughter Ashley, who also works at Triangle. On the weekends, you can find Scott working in his yard or growing vegetables in his garden. In bad weather, he’ll be in his basement woodshop making furniture or in the garage fixing something. Even in his free time, Scott likes to keep busy and he does not see himself retiring any time soon. This should not surprise anyone who knows Scott or his 80-year-old father, who can still be found climbing ladders as a building contractor. Work ethic is an essential principle Scott lives by. He learned it at a young age from his farming family and his father. It would only become stronger throughout his tenure at Triangle. The advice he offers to new associates is to understand that work ethic is always recognizable and it will accelerate your career as well as your personal satisfaction. He encourages everyone to work to the best of your ability and always look for ways to improve your work. Congratulations on your anniversary and thank you for your service!